There are few better uses for a lazy summer afternoon than sending brightly colored golf balls careening past the turning wheels of a plastic windmill. Minigolf takes the more exclusive prerequisites of the gentleman’s game—upper-body strength; access to courses; comically put-upon caddies—and replaces them with gimmicky obstacles, tacky animal-or-pirate themed decorations, and easy proximity to go-carts, should you feel like storming off because your brother is a cheater and/or lucky. But how does one choose between these outdoor palaces of scored frustration? Dan Caprera has you covered. 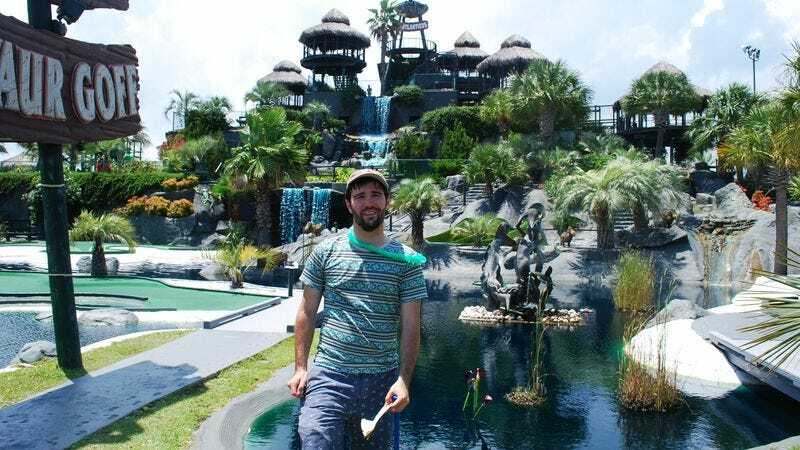 All summer long, this intrepid traveler has been crisscrossing the country, visiting the most highly rated putt-putt establishment in each state (Yelp and Google were consulted) and reporting back on whether each deserves its reputation. The odyssey began back in June with a trip to Colorado’s Adventure Golf & Raceway, and it will eventually hit all 50 states (yes, even Alaska), plus Washington D.C. Addressing what Caprera cheekily refers to as a “troubling lack of literature on the subject,” America’s Best Mini Golf essentially “reviews” each course, offering pros and cons alongside some local color. Still, like a lot of criticism, there’s a service component to America’s Best Mini Golf; for fellow minigolf fanatics, this is basically a consumer guide. Because if you’re going to spend your Saturday waiting impatiently behind that weirdly competitive dad and his preteen son who’d rather not be there and his toddler who’s just kind of dicking around so why can’t they just let your group pass, do it at the best mini-golf courses the nation has to provide.